You are welcome to the Pacific Coast Region of APPA (PCAPPA). PCAPPA is one of the six APPA regions and PCAPPA supports Alaska, California, Hawaii, Nevada, Oregon, Washington, British Columbia, Yukon Territory, State of Baja California, Baja California Sur, and Guam. Our main goal is to provide you with essential Facilities Leadership Development programs that will enable you to align your facilities organization to support the academic success of your institution. PCAPPA together with its Chapters and APPA provide training and developmental opportunities that target all levels of your organizational from entry level staff to supervisors, managers, and yes, senior managers and leaders. PCAPPA partners with industry experts and seasoned professionals to ensure you have timely information and critical knowledge to support the expanding and evolving roles of your facilities personnel and the changing facilities environment. I look forward to working with you and your staff to develop great professionals and leaders well equipped to enhance and to transform your institution and the facilities profession. We are all in this together. PCAPPA is proud to announce the appointment of the 2017-2018 Board of Directors. This group of talented professionals will lend their expertise, energy, and vision to the ongoing mission of PCAPPA. Visit the Board Members page to meet your new board. 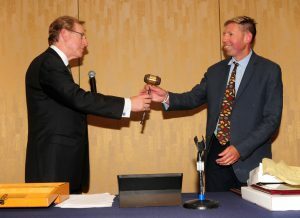 In the pictures at right, outgoing president John Ferris passes the gavel to incoming president Robert Andrews. Click here for more images from the 2017 Joint Conference. Portland Community College (PCC) is honored to receive the APPA 2016 Sustainability Award. This Sustainability Award in Facilities Management is designed to recognize and advance sustainability excellence in educational facilities. 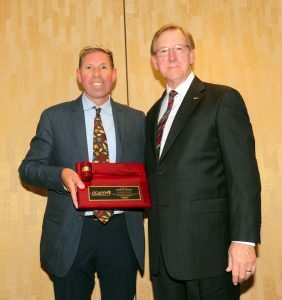 This annual award recognizes a facilities management department that has integrated sustainable policies and practices throughout all facets of the organization and embedded them within the educational institution. • Measuring and reducing scope III emissions through sustainable purchasing, alternative transportation and green cleaning. 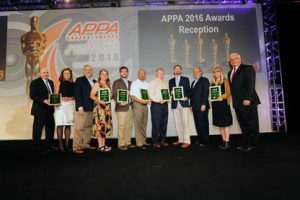 APPA announced this prestigious honor at the annual July conference this year in Nashville as well as in the Sept/Oct 2016 Facilities Manager magazine. PCAPPA is proud to announce the formation of the San Francisco Bay Area (BAYAPPA) Chapter!! Check out their website for more information!